t*rexes and tiaras: I heart robot.. 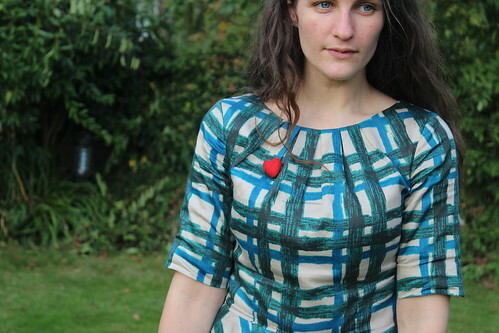 This beautiful Boden dress turned up a few weeks ago and has been hanging around willing me to wear it ever since. But then the weather got all warm and stuff and I didn't think it was quite the thing. 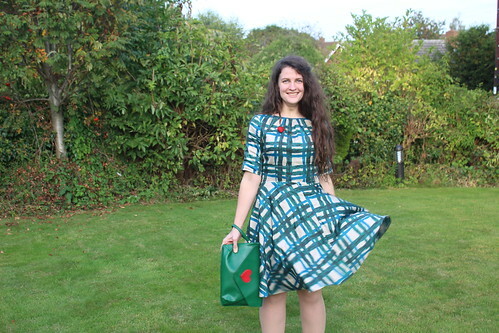 I had visions of leafy outsidey-ness for this dress, as Boden makes me think of the out of doors and exploring. Not that I was really exploring this garden, but still. 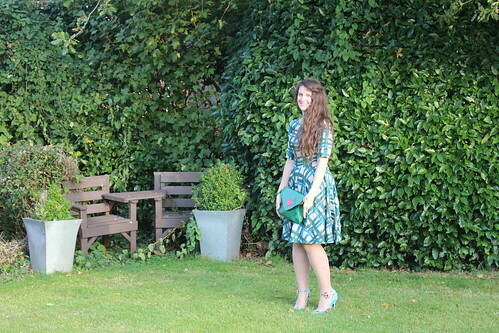 So, what can I say about the Amy Dress other than I absolutely adore it? The colours are beautiful blues and sea greens on a pale grey background, which I think just work so perfectly together. It's sleeves are the perfect length, which is praise indeed coming from me, who doesn't often wear dresses with sleeves! 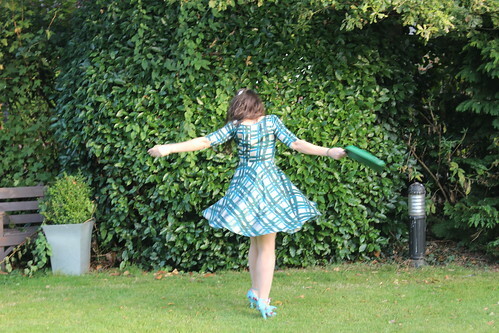 The skirt is such a fabulous full, Fifties style that it makes you want to twirl. 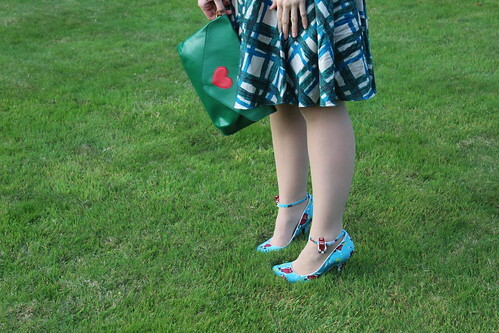 I wore it with my Irregular Choice robot heels, which are almost the same blue and have tiny red robots printed on them, so I decided to add my favourite red heart brooch to the dress to match them. 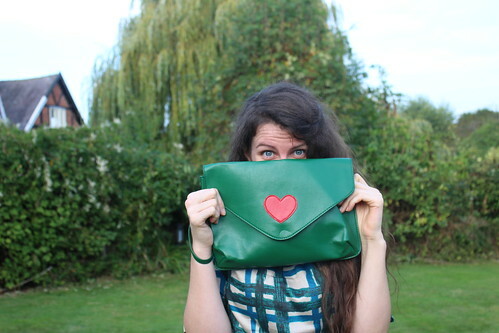 Whilst on the heart theme, I figured it was the perfect opportunity for my new Pepa Loves clutch to have it's first outing. I was so nicely surprised by it's lovely quality! I was drawn to this dress when I first saw it. I'm a dan if the sleeve length too. These are some great shots of you Char, you look really pretty, relaxed and happy. I really love the sleeve length and have been trying to replicate it on my recent makes. Thank you, it was quite funny to have a willing photographer for a change as M refuses to take photos, ever! This is very lovely! I must admit to not having been convinced by it in the promo shots but you look truly gorgeous in it, and these photos are very lovely. GOOD WORK, BUDDY! I do think it can be hard to tell from the photos sometimes, it was a LOT nicer than I'd expected when it arrived, I must admit! That dress is so beautiful on you and the material looks like great quality, and the colours are just lovely! 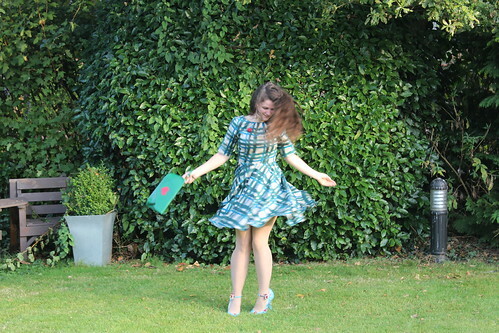 I love your swishing photos, so fun! thanks so much, I did have fun taking these photos! Ooh, I've been thinking about buying this one: really looks gorgeous on you! It will look amazing on you - go for it! 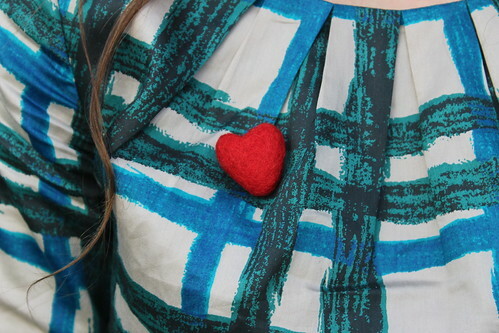 I love the brooch as well, it always makes me smile! You're outside!! I've been eyeing this dress, too expensive for me though, but it's very pretty. I know, such a nice change to take some photos elsewhere!